Another delightful read by Noelle Clark. 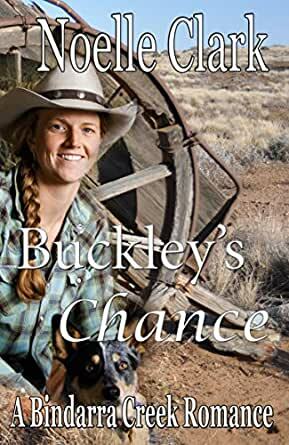 I've read all of Ms Clark's books and Buckley's Chance does not disappoint. Lovable characters in Dave and Charlie, who endure a bumpy road to find joy and happiness together in the equally delightful character filled town of Bindarra Creek. Having visited other country towns mentioned in the story just makes it all the more enjoyable. One of the best in the set loved all aspects of the story from love to greed by family members. Love the Bindarra Creek romances. This book was a gentle read and the characters well balanced. It's nice to read this type of story. Well written story and easy reading for an old guy like me. Now to buy the next Bindarra Creek Romance by this group of authors. What a brilliant way to end this series. Saving the best til last perhaps? It cleverly ties all the bindarra stories together within detracting from the main story of two lost souls finding eachother and ultimately, finding love. Noelle's writing style is captivating and engaging; it transports me into their world. I read this cover to cover!